Events will be added soon! Make a gift using our online form. Contact the Office of University Advancement at (815) 836-5244 during business hours, Monday through Friday, 8:30 a.m.-5:00 p.m. Central Time. Our students will be reaching out to you throughout the year. Click here to learn more about the Lewis University Phonathon. Your check should be made payable to Lewis University and write any specific designations on the memo line. Credit cards are also accepted through the mail. Want to make a gift in person? Visit us on the Main Campus in Romeoville during business hours, Monday through Friday, 8:30 a.m.-5:00 p.m. Central Time. We're located on the second floor of Stritch Hall. Click here for directions to Main Campus. Many employers sponsor matching gift programs and will match charitable contributions or volunteer hours made by their employees. Some companies match gifts made by retirees and/or spouses. If your company is eligible, you can request a matching gift form from your employer, and send it completed and signed with your gift. 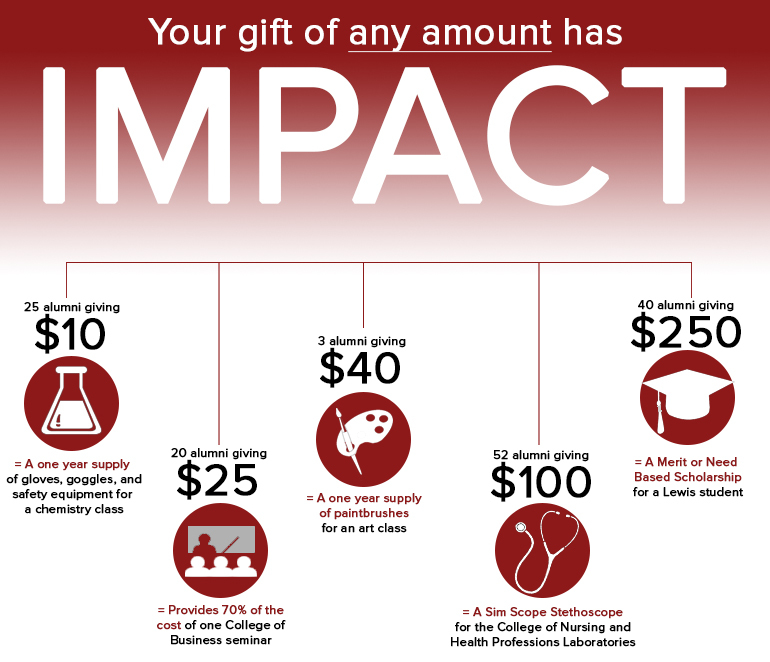 Your gift may be doubled or possibly tripled, causing an even great impact at Lewis University! Be sure and check the "my company will match my gift" box on our online donation form when making a gift. To find out if your company matches your gift, check our online tool. Interested in making a recurring gift? Simply choose the "Recurring Gift" option on the online form. You are able to change or cease the gift at any time by contacting the University Advancement Office. For more information, contact Mary Cronin at (815) 836-5812 or croninme@lewisu.edu. Click here to visit our Volunteer page. For more information, contact Colleen Ahearn at Lewis University at (815) 836-5475 or cahearn@lewisu.edu.